For past many years, fighters pay has been increasingly discussed in UFC. Bunch of MMA fighters who are under UFC banner expresses their disdain and concerns over it. A handful of top UFC fighters already making good money but what about the rest of the fighters on UFC roaster. 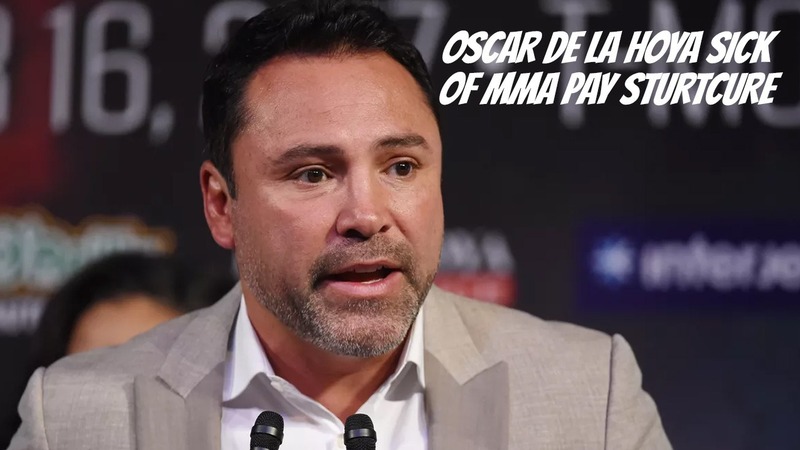 Boxing legend Oscar De La Hoya who teased to getting into MMA as a promoter under his own company Golden Boy MMA recently said to Fight Hub TV, that he’s disgusted by MMA pay structure and plans on to change it. He invited all the disgruntled fighters who are unhappy with pay are most welcome to join him. Former boxer didn’t reveal the pay of both fighters but said they would be well compensated. Many sent some harsh criticism towards on the talks of a trilogy bout, which included UFC President Dana White, who said he would be happy to see his old friend get back into MMA business with De La Hoya but he doesn’t want to see his former Light Heavyweight champion, Chuck Liddell, fighting again inside the cage. Hoya said the trilogy would probably go down by November 24th as he has sent the application to California State Athletic Commission (CSAC) last month, so they can hold the event at The Forum in Inglewood, California. Oscar De La Hoya Challenged Dana White To Fight Him In The Ring!